The 2014 JHU/CLSP Fred Jelinek Memorial PIRE Workshop, modeled on the long line of successful JHU/CLSP Summer Engineering Workshops that all took place at John Hopkins University in Baltimore, will happen in Prague, Czech Republic, supported by the PIRE NSF grant and locally organized by ÚFAL. Videos from all talks are now available at our Videolectures page. Slides from all talks are being collected in workshop SVN (use username: jhuws, password: jhuws for read-only access). Once we're done, we'll put them to an unrestricted place. Friday, August 1, 6-9pm: (Meeting place: venue entrance Malostrasnke, 5:45pm) Farawell Dinner Location: "U potrefene husy" restaurant, just across the Charles Bridge in Platnerska Street (http://www.staropramen.cz/kam-na-pivo/husa/restaurace-praha-platnerska). Wednesday, July 30, 2pm, S1: Stephan Oepen's talk: Broad-Coverage Semantic Dependency Parsing (see also the ÚFAL calendar). Thursday, July 24, 2pm. S1: Alessandro Moschitti's talk (see also the ÚFAL calendar). Thursday, July 24, 6-8pm: Group dinner at Ferdinand, http://www.ferdinanda.cz/ Map: http://mapy.cz/s/bn1k (see also the ÚFAL calendar). Wednesday, July 23, 3:30pm: short tour around some of the venue's highlights - the 11th century rotunda, the National Bank safes and the Center for Visual History Malach with its USC VHI's Holocaust collection & other archives. Freinds and fanily welcome. We will meet at ground floor behind the second glass door (turn right when you get to the ground floor by staircase or by elevators). Or follow people walking there after the SEM team update (which starts 15:15 in S1). of usable time in the daily program. Let us begin this new schedule on Thursday 7/17. Wednesday's talk by Rich Stern will be at 1000 as originally scheduled, while Thursday's talk by Jan Hajic will be at 1100. Let us also take this opportunity to encourage you to schedule, and advertise on this list, discussions or talks which may be of interest to other participants, especially those on other teams. Try to give at least one day's advance notice. The program will also offer initial presentations on July 7 (Refectory, 1st floor, registration starts 8:30), everyday morning/pre-lunch talks in S9, afternoon town hall meetings at 3pm in S1, and final presentations in S9 on August 1. A calendar of the lectures is included in the ÚFAL calendar, their descriptions are on the JHU workshop website. All the lectures will be available later here: http://lectures.ms.mff.cuni.cz and then also on the JHU workshp page and linked from here, too. The venue is not freely accessible. It will be open on July 7 in the morning, and everyone will get a pre-programmed keytag for entry during the workshop (keytags will be distributed at registration, 8:30-9:00 July 7, in front of the refectory where the opening takes place). This keytag has to be used for entering the building using either the main door (8-8) or the side door (24/7). NB: for those NOT arriving in time for the registration Monday morning before 9am, please go to the front desk (turn right just after the main entrance, small glass door) and ask them to let you in for "The Workshop". Then follow signs to S9. If there is any problem, ask the front desk to call ÚFAL secretariat at ext. 4278, or if that does not help, use Jan Hajic's email and/or cellphone (see contacts above). The PRELIM week will take place in S9 (Floor 1), except for the morning of the first day, which will take place in the refectory (Floor 1). The teams will have the following rooms at their disposal: ASR (S8, Floor 1), CLAMR (S10 and S11, both adjacent rooms on Floor 1), PRELIM (S7, Floor 2). The team lectures open to all participants, afternoon town hall meetings and all coffee breaks will take place in S1 (Floor 4). Room S1 will also be available at all other times as a lounge. Final reports and talks will take place in S9 (Aug. 1, Floor 1). [The Steering Committee will meet every Monday, 5-6, in Room 420, Floor 4.] Please note that floors are numbered base 0 (i.e. the U.S. "second floor" is numbered as Floor 1). Coffee breaks will be served near S9 in the PRELIM week, always after the talk (July 7 morning in front of the refectory). Starting week 2, all coffee breaks will take place in S1 (to get some exercise using the irregularly shaped West Wing staircase :-)). Elevators are of course available, too. Exception: on the final day, coffee breaks will be again near S9 where the talks will take place. Lunches, Dinners: except for the reception, farewell dinner and the group dinners, these are up to the teams and individuals to organize. The building sports a cafeteria, open 11am to 2pm for lunch and after 5pm for dinner. Lunch price is discounted, as usual, and substantially lower than elsewhere in the neighborhood (~$6 including soft drinks or beer). Please note that in the final week (July 28 - August 1), the cafeteria will be open only 11-12 due to another event with catered lunches taking place there at noon. There are many places to eat out, as expected in a very touristy area. upon arrival, everybody has to go to the appropriate Reception of her/his accommodation. HAMU (AMU Hotel/AMU Pension) is located at Tržiště 18, 118 00 Prague 1, across from the U.S. Embassy. It is about a 4 minute walk from the entrance to the Venue. For those arriving by taxi from the Airport or elsewhere, show the taxi driver the address and say you are travelling to the "AMU Hotel". Once you are in the front of the hotel, enter the main door, climb a few steps and there is a front desk on your left, on top of the stairs. If there is any problem checking in, ask for Mr. Bartos (or Mrs. Novakova - we made the reservation through Mr. Bartos but he might be on vacation (July 5 - July 14)). Hotel Pod Věží (http://www.podvezi.com/contact) is located at the foot of the Charles Bridge. The front desk is in the building just next to the bridge tower, most rooms will be in a building across the street. For the taxi driver, use the following address: Hotel Pod Věží, Mostecká 58/2, 11801 Prague 1. The front desk is best accessible from the corner hidden to the left of the tower. The distance to the Venue is about 5 minutes by walking. The Residence Malostranská (http://www.residence-malostranska.com/en/lokality) is located directly at Malostranské náměstí, on the corner of Mostecká street which leads to the Charles Bridge. Since you will be coming by their transfer service, they will point you to the front desk inside the building (there is a long corridor straight ahead behind the main door, and the front desk is after 20m on the right). The Residence is about 2 minutes from the Venue. 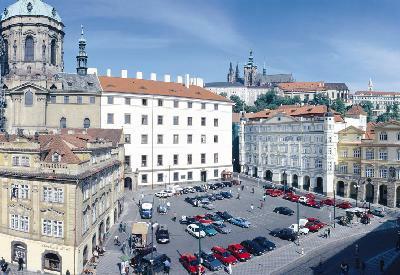 Some of the participants will be staying in http://apartments-in-prague.org/rental-apartments-in-prague/apartment-vlasska-6. This is past HAMU uphill, about 6-7 minute walk from the Venue. Address for a taxi driver: Vlašská 6, 118 00 Prague 1.
a cab: take ONLY "AAA" or "111" yellow taxis. The fare should not go over CZK 600 (USD 30) to "Malostranské náměstí". Ask the driver about the cost beforehand. There is a stand inside Terminal 2, just after leaving customs. Taxi drivers should ALWAYS issue a signed receipt. They should accept CCs (ask at the stand and the driver! ), CZK and EUR (not a very favorable exchange rate), but not USD. public bus/metro/tram: take bus No. 119 (departure: Terminal 2; that's where most EU flights except UK land) direction "Dejvická". Get out at "Dejvická" (final stop). Then change for Metro line A (green line), go two stops to "Malostranská". Then, take tram No. 12 or 20 or 22 to Malostranské náměstí. Tickets can be bought (coins only) at a machine at the bus stop, in CZK, and cost 32 CZK (1.60 USD) one way, changes permitted but ticket has to be stamped in the first bus/metro/tram you enter. Public transport is frequent, cheap and reliable and operates 5am-midnight, with some night trams running overnight. Please refer to http://www.dpp.cz/en for more information. 30 min. ticket is 24,- CZK (USD 1.20), 90 minute ticket is 32,- CZK (USD 1.60). Children 6-15 are half price, free if under 6 years of age. Transfers are allowed among regularly scheduled routes (bus/tram/metro) within the city limits and within the max. time bought. Tickets have to be stamped upon entry to the first car/bus. 1 day unlimited tickets are 110,- CZK (USD 5.50), passes are irrelevant since everyone stays in a walking distance. Senior/student fare is irrelevant too for non-EU citizens, but even then, it might take time to get the PIT/student card without which they cannot be used. Tickets have to be bought before boarding the metro/tram/bus, either at ticket machines (CZK coins only) at some tram stops and most metro stations, or at newspaper stands. One such newspaper stands is at Malostranské náměstí (see the map referred to above), and a ticket machine is at the tram stop at Malostranské náměstí (direction Nový Smíchov Shopping Center/Újezd). Restaurant Pivo & Basilico, about 100m from the Venue, vegetarian/meat dinner choice, full menu. Friday, August 1, 6-9pm: (Meeting place: venue entrance Malostrasnke, 5:45pm) Farawell Dinner Location: "U potrefene husy" restaurant, just across the Charles Bridge in Platnerska Street (http://www.staropramen.cz/kam-na-pivo/husa/restaurace-praha-platnerska). Please fill in your menu choice at the Doodle Poll (now closed) before Tuesday noon. Group dinners (self-paid) will take place on Thursdays (July 10, July 17, July 24) in the first three weeks, and on Wednesday, July 30 in the last week.